How Many Millionaires Have You Met? Last night’s new panel game, Who Said That? 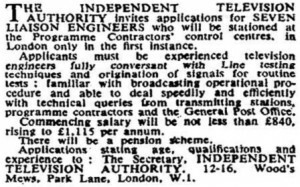 – where the object is to guess the sources of quotations and then discuss them, attracted the attention of the Daily Express’ Cyril Aynsley. 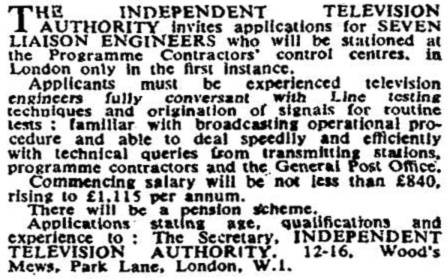 It’s a land of opportunity today: the Independent Television Authority are advertising for experienced engineers while Granada are looking for architects and draughtsmen to help with the design of television studios.